It is hard to imagine our lives without RDI. Our son, Alex, was born with CHARGE syndrome, a genetic disorder involving numerous serious physical issues which required 4 months of hospitalization at birth and quite a few surgeries after that. 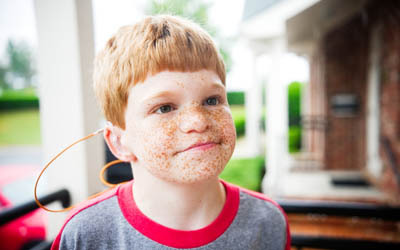 His syndrome includes profound hearing loss and is accompanied with significant developmental delays. The traditional therapies, speech, occupational and physical therapy were somewhat helpful, but progress was minimal, and we struggled tremendously with communication and behavior issues and had no idea how to help him. RDI was truly an answer to prayer. RDI is a cognitive developmental therapy which addresses your child’s unique cognitive deficits and empowers you as parents to help them overcome their deficits, using their unique strengths and abilities. I am aware of no other therapy that addresses your child’s cognitive deficits themselves. Instead, most seem to target the resulting behaviors. Of course we want difficult behavior to go away, but addressing behaviors exclusively often does not resolve the underlying issue. So what does that all mean and what does RDI look like? RDI turns the traditional therapy paradigm on its head. Your consultant works primarily with you as parents and teaches you how to work with your child to address their deficits. You take videos of yourself, review them yourself and then get feedback from your Consultant on how to improve the way you work with your child. This allows you to engage with your child in his or her most comfortable setting – at home – and allows development to happen organically. It is a very productive and integrated therapy because it eventually becomes part of your normal routine and natural parent/child interactions. It is an intensive experience, but from my perspective, it is the real solution for my son’s delays. For example, our Consultant recognized that my son never asked any questions. Using his strengths of typing and reading, we exposed him to questions naturally, demonstrating questions you typically ask people. You ask Mommy “What’s for dinner?” and you ask Daddy “How was the traffic today?” After much work and exposure, Alex asks us tons of questions normally and naturally now, demonstrating true curiosity. RDI does not teach children in a rote, robotic way, but instead it uses mindful and methodical modeling in order to help children discover things on their own. RDI empowers our children function in an ever-changing world, using dynamic communication and thinking. Recently, Alex started having a daily meltdown due to anger, frustration or stress and would act out inappropriately. Punishing him for acting out doesn’t work and does not address the real, underlying issue — his frustration. RDI taught us to work with Alex to create a plan of strategies to employ when he’s upset, in order to cope with his emotions appropriately. He has learned to express himself verbally saying “I am so mad!”, do deep breathing, count to 10, do some yoga poses, eat a piece of chocolate, etc. to better manage his frustration, help his body calm down and become centered and regulated again. He needs to be able to use the same coping strategies that we all do to handle our emotions. Presenting these strategies to him in writing, in a mindful way, has helped him manage his frustration and has made our lives much calmer. Most importantly, it addresses the real issue, not just the behavior. A final example is planning. Often, parents don’t want to share upcoming events with their kids because they become too excited about them and get upset if plans change. But this is part of the dynamic world we live in — plans sometimes change. RDI taught us to think about this differently. Knowing future plans is important and calming, and kids have a right to know what’s going on. And they need to learn to become planners themselves, a crucial cognitive skill. Think about all the planning you do all day every day, and imagine how crippling life would be without the ability to do so. I knew we were a true RDI family when the first words out of Alex’s mouth every day were “What is the plan for today?” He has also learned “Plan B” thinking for when plans change. When bad weather postponed our upcoming beach trip that he was extremely excited about, we made an alternate plan for the day we would have left, and he handled it just fine. If it rains when have planned a trip to the park, we make a Plan B and life goes on without a meltdown because he knows how to consider alternatives. These are just a few of the successes we’ve experienced along our RDI journey. We are so grateful for all that we’ve learned and continue to learn through RDI. Our lives have been forever changed due to this unique and amazing therapeutic approach and the work of our outstanding Consultant.